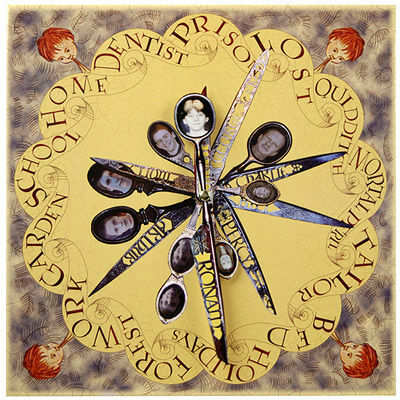 Pat Peters (such a wonderful Marvel-sounding name) recently shared his take on the Weasley Clock, a device that hangs on the wall of The Burrow, the rickety home inhabited by the Weasley family in the Harry Potter series. The clock in the movie has misplaced “mortal peril”, but aside from that it looks a lot like what we’d imagined from the books. There’s a reason why more and more Harry Potter-themed builds are appearing online. The small size of devices such as the Raspberry Pi and Arduino allow for a digital ‘brain’ to live within an ordinary object, allowing control over it that you could easily confuse with magic… if you allow yourself to believe in such things. So with last week’s Real-life Daily Prophet doing so well, it’s only right to share another Harry Potter-inspired project. The clock serves not to tell the time but, rather, to indicate the location of Molly, Arthur, and the horde of Weasley children. And using the OwnTracks GPS app for smartphones, Pat’s clock does exactly the same thing. 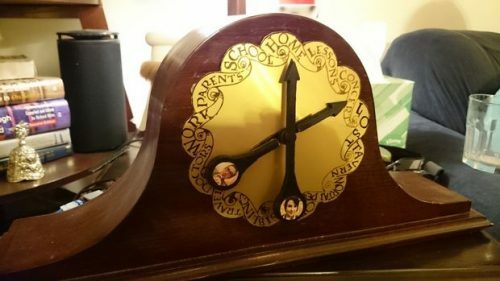 Pat has posted the entire build on instructables, allowing every budding witch and wizard (and possibly a curious Muggle or two) the chance to build their own Weasley Clock. This location clock works through a Raspberry Pi which subscribes to an MQTT broker that our phones publish events to. Our phones (running the OwnTracks GPS app) send a message to the broker whenever we cross into or out of one of our waypoints that we have set up in OwnTracks; this then triggers the Raspberry Pi to run a servo that moves the clock hand to show our location. There are no words for how much we love this. Here at Pi Towers we definitely have a soft spot for Harry Potter-themed builds, so make sure to share your own with us in the comments below, or across our social media channels on Facebook, Twitter, Instagram, YouTube and G+. This is so awesome! This, with the Daily Prophet and hands-free chess build, any muggle home can now become Potterized into a magical and whimsical place. Now, to add an extra gear to the hands, so that the pictures rotate in sync with the hands, so they’re always upright. Maybe use a pivot and a weight so gravity keeps the picture upright? It’s an Arduino based build, but one of my wife’s former co-workers build a Weasley clock for a Hackathon. Bonus, contains legos. You can move the outer ring and let the location be in top of the clock. That would be super cool to do! Unfortunately, I wouldn’t be able to get that to work, because I’m tracking both my position and my wife’s position with individual clock hands. So if we’re in two different places it wouldn’t quite work out. Thanks for the idea though! Thank you so much for writing about my project, Alex! I get the weekly emails of Raspberry Pi projects from the foundation, and it completely took me aback to see my location clock on the front page!